Helping Businesses Turn Advertising Into Profit! Win Win Win Marketing is a Direct Response Marketing advertising agency. We are specialized in high volume ad campaigns on Google Display Network, Youtube, Facebook and Native Ad Networks. We have successfully been using Adwords since 2004 and Facebook ads since 2009 and have experience from finance, health, weight loss, self-help, and biz-op. We specialize in info products, online courses, seminars, lead generation and ecommerce. Research of competition and target audience. This will decide the targeting and ad copy. Test - The goal at this stage is to discover what works and what doesn't. ROI here is a bonus. Verify - Prove that test results are valid and then optimise for incremental gains. Scale - When we have reached the target ROI we scale. We help Small and Medium Sized Businesses get more leads and sales with paid traffic. 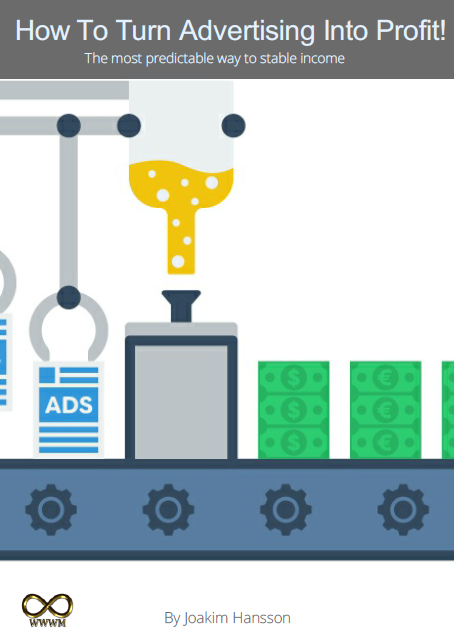 If you have a proven funnel our world class media buyers can scale traffic for you profitably. If you need a converting funnel, our funnel architect, world class copywriters and tech team can create that for you. We are based in Europe, but you don’t need to be. We work with clients “virtually” using telephone, Skype, online meetings with video. We communicate in English and Swedish. "Joakim is a perfect mix between artist and scientist in the Facebook ad campaigns he manages for me. In his first 90 days he reduces our lead cost buy 63% which massively increased our bottom line. For our last seminar tour he managed all ad campaigns that generated 10,280 seminar registrants in just 48 days." Hi I'm Joakim and I'm the founder of Win Win Win Marketing. I'm a Digital Marketing Strategist from Sweden living in Spain. I've been working in sales and marketing as an entrepreneur since I was in my early twenties back at the end of the eighties. For years I struggled with getting measurable results from marketing and advertising in my business. Then I discovered an almost 100 year old little known method how to "educate" the prospects so they can make an informed decision. People buy from someone they know, trust and like. When you educate you become a trusted authority instead of a sales person. So when they are ready to buy, you are their first choice because the know, trust and like you. Based on those principles I created a modern system that generates predictable, scalable profitable results from your advertising. Now I help other business owners turn advertising into profit with that system. More leads, customers, increased sales and profit. "Before working with Joakim, I sucked (really sucked) at getting traffic by myself. I couldn't set my campaigns up correctly. Joakim and I were introduced and I worked with him. A few hours later my first campaigns were up, running and converting. I can't begin to endorse him enough because he's my secret weapon when it comes to creating ads that get clients to my website. If you're considering working with Joakim, don't think. Get in touch with him and he'll have you on the right path in no time"
"I’ve been super-impressed working with Joakim on a recent project. As you’d expect he gets leads at a very low price, however what really impressed me was he doesn’t focus on low lead prices, but rather high lead value. So he actively develops his campaigns to find well qualified, highly suitable leads instead of ‘freebie-seeker’ type leads. And even better, he knows direct response back to front. He worked right through the funnel with me to maximise conversions at every stage, and to make sure the message and target audience are consistent from start to finish. It’s rare to find someone who does this. And it’s why I’ve already recommended him to other clients. At the end of the day, anyone can get leads but Joakim knows how to get sales." Call us, we actually pick up the phone! Leave your info and we'll contact you today! "Joakim is highly structured with good skills in managing people. Joakim has a significant talent to see solutions in a complex structure." How To Turn Advertising Into Profit! In this report you’ll discover the method of how to turn advertising into profit so that you never have to struggle with cash flow again. You’ll discover how this method will send you well informed, qualified prospects that are ready to buy from You, so you don't have to prospect or cold call ever again. You’ll find a blueprint to follow that you can use over and over again. Just enter your information below and we'll send you the report right away. Your information is safe and is ﻿j﻿﻿﻿﻿﻿u﻿﻿st﻿ for us. It will never be shared with anyone.